Ideal for compact beds. 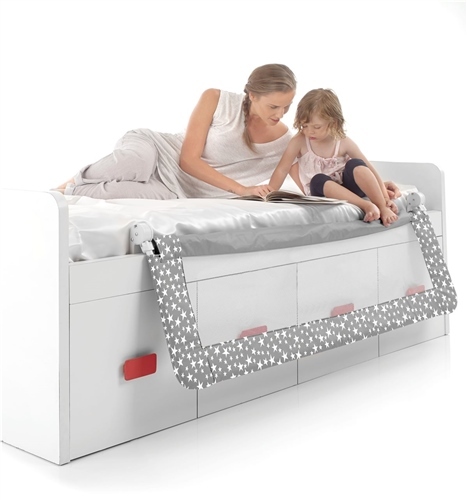 Flexible and easy to use and perfect for helping the transition from cot to bed. Suitable for children from 18 months to 5 years. Really pleased with product. Exactly as described. Sturdy enough. It fits really well on my daughters day bed and looks nice too. Doing a good job at keeping her safe. The only couple of negative comments was the assembly instructions I had to go on you tube to figure out exactly which bits went where! Also it says to lift bar down to do it simultaneously however unless you have extra long arms it’s not possible to reach both ends at the same time. You have to do one at a time but with a knack as while you go release one side the other side clicks back in and while you hold it out to stop it clicking back in, it makes it harder to release the other side. But once got used to it it’s fine.